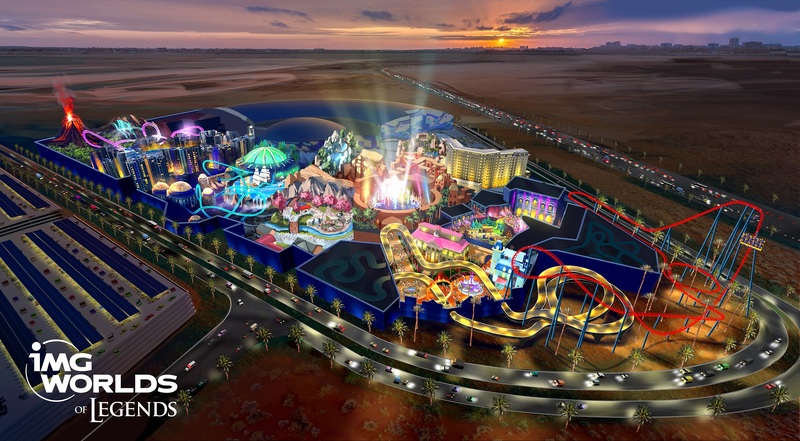 IMG Worlds, Dubai-based owner and operator of the world’s largest indoor theme park, IMG Worlds of Adventure, announces the launch of its latest project, IMG Worlds of Legends. With nine unique zones spread across over 2 million square feet, IMG Worlds of Legends will feature some of the most exciting and popular brands in the world, making it one of the biggest global licensing deals of its kind. IMG Worlds of Legends, situated adjacent to IMG Worlds of Adventure, will feature futuristic interactive rollercoasters, state-of-the-art rides, breath-taking water-based attractions, and spectacular live entertainment. With its temperature-controlled environment and retractable roof, guests are offered the choice of enjoying the thrilling rides safely protected from the desert heat in summer or basking in the sun on the sky-high coasters in winter as IMG Worlds of Legends is open 365 days a year, offering the best of both worlds. Owned and operated by IMG Worlds, IMG Worlds of Legends will offer a fully immersive experience, with each zone in the theme of a different imaginary world, complete with 104,000 square feet of food and beverage space and 102,000 square feet of retail space. IMG Worlds of Legends will connect to IMG Worlds of Adventure via a state-of-the-art sky bridge, which will double as a gateway to the park. There will also be a pedestrian walkway, allowing easy transit between the two parks. Guests will be able to purchase tickets to each park separately or choose a multiple park pass for the ultimate day out for families and friends.